What is a Mexistim Polarity Cycler? The Mexistim is based on Lee Crocks 2nd version of the ‘Energy Cleaner’. The 2nd version was used with good results on over 10,000 people according to the inventor. Unfortunately, Lee Crock passed away in March 2010. I received an email from one of his daughters saying the family would close the clinic. All of their websites no longer function. Normally I question such devices since they do not seem to work according to normal electronic principles. However, having used the Mexistim device while sleeping, I have noted positive changes for years now, I can only attribute them to the Mexistim. You can read the entire story Lee Crock and his ‘Aura Therapy’ / Energy Cleaner Machine if you want to know more. As you know, no one can make claims of cures without running afoul of the medical establishment who themselves don’t have absolute cures. 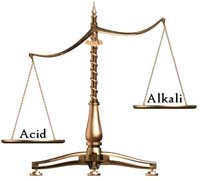 Each person’s body is different with a constantly changing acid and alkali balance, varying daily stresses and other factors which affect healing. We are basically living filters which trap all kinds of toxins and noxious materials from the food we eat, the water we drink and the air we breathe and which settle in our tissues to bring about a variety of illnesses, cancer and even organ failure. I make NO CLAIMS regarding any claims of cures or healing from using the Mexistim. All the Mexistim does is switch the polarity from batteries and that polarity is applied to a conductive wirescreen. Nothing more. If you have health issues, please consult a qualified medical practitioner. What I do relate are my own experiences and examples of email anecdotes regarding the experiences of others who have built their own, bought copies of my Mexistim or bought one of my original Mexistims as described and sold herein. Lee Crock currently charges $1,000 (as of December 2009) down from his original price of $3,000, for his Energy cleaner which, in its new incarnation is nothing like the original units. I tried to keep the price of mine affordable for anyone at $230.00 plus UPS shipping. The Mexistim’s I build are custom built per order, not stamped out in some big factory production with jacked up prices to pay for the production machines. In my opinion, the best thing anyone can do is try something and if it doesn’t benefit you, move on to something else. Our best hope is we don’t try something which makes us worse! No one has ever experienced any negative effects from use of the Mexistim. That is one reason I included an article which has a simple diagram showing how to build and test your own simple version of the Mexistim. This way, you can decide for yourself it it does anything for you. When I lived in Dallas for some 25 years, I periodically had all of the above problems which is why I noticed as they dissipated and I realized it was after I starting sleeping on a 3 X 4 foot aluminum wirescreen pad on top of my mattress which was connected to my bedside Mexistim unit. Others have written with their own experiences and anecdotes relating dissipation of arthritis, cancer, improved memory due to Alztheimers and dementia and various other benefits. I wrote about it and received emails from people asking if I could build a Mexistim for them as they couldn’t afford Lee’s $3,000 units (at the time of the original article linked below), though now he sells them for $1,000. So I decided I could build them much cheaper ($230US) on a per order basis. No big warehouse or store of parts, just my little workshop and my own timer design. Others have copied my Mexistim design, used my articles to sell their versions and refer to theirs as ‘similar to the Mexistim’, but my Mexistim is based on the 2nd Crock design using a single wirescreen, which had so many reports of beneficial experiences. * One thing that is common is the fingernails get harder and sometimes longer. * My hair is getting darker. * I have found several scars that I had on my body have disappeared – like I removed them. * There is always a feeling of heat coming from the pad. * My skin is getting a younger look and feeling. * My facial skin is getting tighter. * It makes me sleep like a baby. * It removes my headache in just a few minutes when I lay on the cleaner pad. * After one night sleeping on the pad, I didn’t need pain medication for my arthritis. * For years my arm went to sleep while sleeping at night, but now it doesn’t, when I use the cleaner machine. * It seems to help when on long trips – I don’t get as tired. * It removed the pain from my back when I lifted too much. * Hooked to my exercise cycle, it seems to give me longer staying power while using the bike. CALDWELL – Leander E. Crock, 85, of Caldwell, Ohio, passed away Tuesday (March 16, 2010) at the Grant Medical Center in Columbus, Ohio. He was born in Noble County, Ohio, a son of the late Roman and Sophia Schafer Crock. Lee is survived by his wife, Bonnie Crock of the home, whom he married May of 1991; daughters, Judy (Jack) Robinson and Vickie Sawyer, all of Caldwell; sons, Don (Julie) Crock, Dennis (Thomasina) Crock, Edward (Kathy) Crock and Dan (Vanessa) Sawyer, all of Caldwell and extended family. Friends will be received Friday (March 19, 2010) from 2 to 4 and 6 to 8 p.m. at the Chandler Funeral Home, 609 West St., Caldwell, Ohio 43724, with a vigil service at 8 p.m. A Mass of Christian burial will be held Saturday at 10:30 a.m. at St. Mary’s of the Immaculate Conception Church in Fulda with the Rev. Father Thomas Hamm serving as celebrant. Burial will follow in the St. Mary’s Catholic Cemetery, where the Noble County Veteran Service Organizations will conduct military graveside services. The family requests those wishing to make memorial contributions consider his favorite charity, Feed The Children, P.O. Box 36, Oklahoma City, Okla. 73101-0036. To send a sympathy card or leave words of comfort for the family, please visit the funeral home’s Web site at http://www.ChandlerFuneralHome.net . I recieved an email from one of his daughters saying the family would close the clinic. All of their websites no longer function. The Lee Crock Energy Cleaner. The machine is very basic. 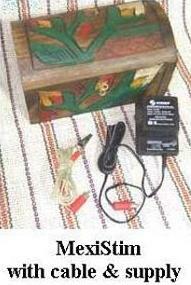 It is 10 D batteries in a parrellel series so as to create 3 volts. The positives are bundled as are the negatives. One wire, with an alligator clip at either end is then connected to a wire mesh screen and then one end to the positive or negative end and swapped polarity every 15 minutes or so while you lay on the screen. With some no-how a timer and auto switch can also be added so switching is automated. Basically you feed the positive end into the mesh screen for 15 minutes and then the negative. There is no closed loop. Can someone give me a scientific explanation as to HOW this machine supposedly effects healing and such. I am guessing that the single polarity feeds back on itself creating a standing wave, but am not 100% sure. Also, whatever wave it is creating, how does this bring about the healing? What is it actually doing to the bodies energy field and cells etc? And what happens if one just sits on the negative and not the positive, or vice versa? I have spoke with a few people that have used this machine with amazing success but they cant tell me scientifically how it works. And I am a guy that wants to know why. I know energy can be misused to cause harm to the body and want to avoid that. The idea is to achieve an artificial change in the natural cellular polarity for fifteen minutes, after treatment the cells tend to restore its original polarity and stimulates this process in cell metabolism. The device does so with electricity. All told, there have been more than 150 different eruptions over the past couple of centuries where volcanic lightning has been recorded. In fact, I’ve managed to dig up some photographs of volcanic lightning from before I was born! Here’s Mount Vesuvius — and the accompanying volcanic lightning — from 1944! Okay, so now you’re convinced that lightning happens in volcanic ash all the time. Yes, it makes for a spectacular picture, but how do you get this in the first place? Well, what is lightning? You create a big enough electric potential difference between two places, and you can get all of these excess charges to “jump down” to the lower potential. that goes from a high cloud down to the ground can have a voltage difference in excess of a billion Volts! You can do this because you can get a huge amount of charge separation. For example, in a big lightning strike, you separate out about 1020 electrons! But ash and rocks — even molten rock — are electrically neutral, right? So how to we get a big voltage from neutral matter? Thankfully, the ash that comes out is hot enough so that not every particle is neutral: many are positively charged ions and many are negatively charged ions. “What is so surprising is that rapid, almost sudden, changes take place in the Earth’s magnetic field,” said study co-author Nils Olsen, a geophysicist at the Danish National Space Center in Copenhagen. The findings suggest similarly quick changes are simultaneously occurring in the liquid metal, 1,900 miles (3,000 kilometers) below the surface, he said. The swirling flow of molten iron and nickel around Earth’s solid center triggers an electrical current, which generates the planet’s magnetic field. The study, published recently in Nature Geoscience, modeled Earth’s magnetic field using nine years of highly accurate satellite data. The decline in the magnetic field also is opening Earth’s upper atmosphere to intense charged particle radiation, scientists say. Satellite data show the geomagnetic field decreasing in the South Atlantic region, Mandea said, adding that an oval-shaped area east of Brazil is significantly weaker than similar latitudes in other parts of the world. “It is in this region that the shielding effect of the magnetic field is severely reduced, thus allowing high energy particles of the hard radiation belt to penetrate deep into the upper atmosphere to altitudes below a hundred kilometers (62 miles),” Mandea said. This radiation does not influence temperatures on Earth. I’m pleased to offer these interesting volumes that you might wish to add to your collection too. Sure there are many sources on the internet but these and whatever else for sale here help support KeelyNet and my ‘livin la vida loca’ (right!) here in glorious Mejico! $20 – Breakthrough to Free Energy Devices – this book hasn’t been available since 2006. Since the first edition of this book in 1977, the world’s scientific system has been undergoing a large revamping. The old physics is giving way to new expanded concepts of the universe and man’s relation to it. Ideas such as order from chaos, faster-than-light particles, and a new version of the ether (tachyon field), which would have been unthinkable 12 years ago, are now being readily accepted by many orthodox scientists. $6 – The Annotated Vril – This fascinating ebook is an original occult fantasy dealing with the mental control of zero point energy to produce effects in matter. Vril is the author’s name for this force which is focused and projected using ‘Vril Rods’. The Vril force is a fluid capable of being raised and disciplined into the mightiest agency over all forms of matter, animate or inanimate. It can destroy like the flash of lightning; yet, differently applied, it can replenish or invigorate life, heal, and preserve, and on it they chiefly rely for the cure of disease, or rather the enabling the physical organization to re-establish the due equilibrium of its natural powers, and thereby to cure itself. By this agency they rend way through the most solid substances, and open valleys for culture through the rocks of their subterranean wilderness. Dan Davidson’s Breakthrough to Free Energy Devices contains many insights into the entire field including some Keely anecdotes of interest. I have always been a fan of the Vril Force story, seeing within it a direct correlation to how we can tap universal energy as aether, vril, chi, zpe or whatever you choose to call it. And there are a few gravity anomalies that add to the Smokey God story. What if spherical bodies are actually hollow and have an interior sun which could support life? WOW, does that mean my theory that the moon is a hollow body containing a giant hotel where people live til the earth recovers from climate disasters, could be true? Remember the Moon DID ‘ring like a bell’ when ‘during the Apollo 13 mission, part of the disposable rocket crashed into the moon and the seismometer picked up a reading that the moon was ringing like a bell.’! We are told the earth has a liquid metal core at 1900 miles down (3,000 kilometers) but could they be wrong? After all, it is impossible to drill that far down. So how far has man actually drilled? Current Maximum depth: 23000 feet ft. below seafloor. The deepest hole drilled by man was the Kola Hole, going 12,3 km down. The Earth’s continental crust is about 30-50 km thick. Doug Stanhope the comedian does a hilarious routine about old people wanting to live another few years…in the skit, a guy begs people to change his bag or help him get around and thank god he has have lived another day..
Doctors warned today that those embracing religion in adult life are often not receiving the vital medical attention they need to avoid potentially dangerous complications during labour. As a result, the lives of born-again Christians are routinely being blighted by incurable conditions such as smugness, chronic evangelism and an inability to conduct a conversation without mentioning the name ‘Jesus’. The second “clip” ran eventually 1 day and most of one night. A friend destroyed the endeavor. I hope the annotation at the end may bring somewhat of a deeper meaning to the post…the third clip “version” worked (approx 3 ½ days) The “rod” from the wheel to the magnet failed in the middle from stress. Is it possible that an antigravity generator exists that can serve as clean source of energy and revolutionize transportation by creating a whole new class of vehicles: vehicles that defy gravity and travel at incredible speeds? I find it hard to believe, but you judge for yourself whether you believe an inventor has the knowhow to make a vehicle that can hover effortlessly and travel at incredible speeds. The story goes like this: A young British professor beset by recurring dreams builds a circular generator composed of magnets and coils. After assembling it, he invites a colleague over and sets the device in motion. Not only does it spin, but the speed of the spin increases without any energy input. Then, unexpectedly, as the two men watch, the device rises up to the ceiling of the laboratory and smashes its way through the roof. Outside it keeps on flying, causing birds that get near it to fall to the ground and tearing roof tiles off buildings. The first flight of a fantastic device. But it wasn’t fantasy to John Searl. 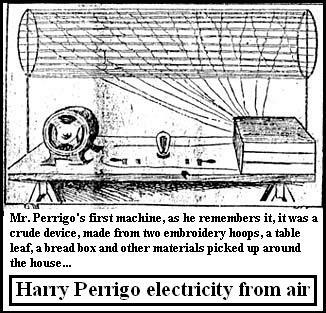 He later goes on to develop the Searl Effect Generator and something he calls an Inverted Gravity Vehicle, or a levity disc, otherwise known as a flying saucer. There, I said it. where is this machine? Why isn’t it being built and tested? That’s what other inventors and scientists have asked for years. And according to critics, the reason it hasn’t been tested is simple: It’s a fraud. Searl’s answer, however, is practical: Patent issues prevent him from revealing all the details and the energy generated is so powerful that it could be a security risk to expose details. Also, the device isn’t ready for public release. Searl has supporters and backers who say his invention works. – (He’s been milking this for years and long ago Anders Heerfordt tried to verify his claims, all lies. Sorry, if he HAS something, he hasn’t been able to do anything with it nor has anyone been able to verify it independently. Great early photos but they could have been tricked up like we do now with Photoshop…save your money, this guy ain’t it. Read it for yourself, Checking up on Searl – 1991 and this Reply to Anders by John Thomas – 1996. I’ve met Searl and John Thomas but still, it’s been what, 60 years now and no proof, nothing on the market, insufficient details for others to verify, etc…just a money pit. What John knows is what Searl tells him, so take that all with a big block of salt. Here it is 2010 and still they are promoting and asking for money. There is a lot more to this story…like Searl calling me around 1993 at 4AM cussing me out, saying Heerforts article on KeelyNet had blown a million dollar movie deal, like one of his wealthy investors meeting with me in Dallas around 1996, asking me to remove anything negative about Searl because it hurt their money raising efforts, Searl being ‘discovered’ living in a junkyard babbling to himself (he still does that)…etc…oh yeah…it’s all about bucks and gullible people. Posted in Alternative Science, energy, Free Energy, Gee Willikers!! !, Gravity Control, Invention, Miscellaneous, Orthodox Science | Comments Off on Fraud or breakthrough? Evolutionists argue that the scientific law of entropy (the tendency of matter to go towards disorder rather than greater order) doesn’t contradict evolutionary theory because they claim the law of entropy doesn’t apply in open systems such as our Earth. Evolutionists will use examples such as a seed becoming a tree as an argument that entropy doesn’t apply in open systems. Evolutionists are wrong on both counts for reasons which will be fully explained in this article. Entropy does occur in open systems. We discovered entropy here on Earth which is an open system in relation to the Sun. 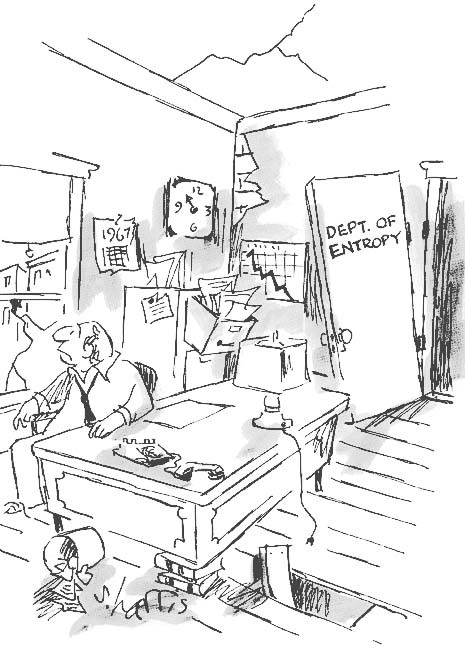 However, entropy applies only to spontaneous or chance processes. The spontaneous (unaided or undirected) tendency of matter is always towards greater disorder — not towards greater order and complexity as evolution would teach. Just having enough energy from the Sun is not sufficient to overcome entropy. This tendency towards disorder, which exists in all matter, can be overcome temporarily only if there exists some energy converting and directing mechanism. The question for evolutionists is how did biological life and order on earth come into existence in the first place when there was no directing code and mechanism in nature for overcoming entropy. The only rational answer is that an intelligent power outside of nature was responsible for the original order. Evolutionists teach that matter has an innate tendency to evolve towards greater and greater complexity or order. We are so accustomed to seeing evolution of technology all about us (new cars, boats, ships, inventions, etc.) that we assume that Nature must work the same way also. Of course, we forget that all those new gadgets and technology had a human designer behind them. Nature, however, does not work the same way. Even the scientific followers of Prigogine, the father of Chaos theory, have admitted that only a very minimal level of order will ever be possible as a result of spontaneous or chance processes. Considering the enormous complexity of life, it is much more logical to believe that the genetic and biological similarities between all species are due to a common Designer rather than common biological ancestry. It is only logical that the great Designer would design similar functions for similar purposes and different functions for different purposes in all of the various forms of life. Contrary to popular belief, scientists have never created life in the laboratory.